If there’s one thing the town of Collingwood has plenty of, it’s the views. Between the ski slopes of Blue Mountain and the water of Georgian Bay, there’s just as much to look at there as there is to do. And now The View — a new condominium project by MacPherson Builders — is offering another vista for homebuyers coming to the community two hours north of Toronto. 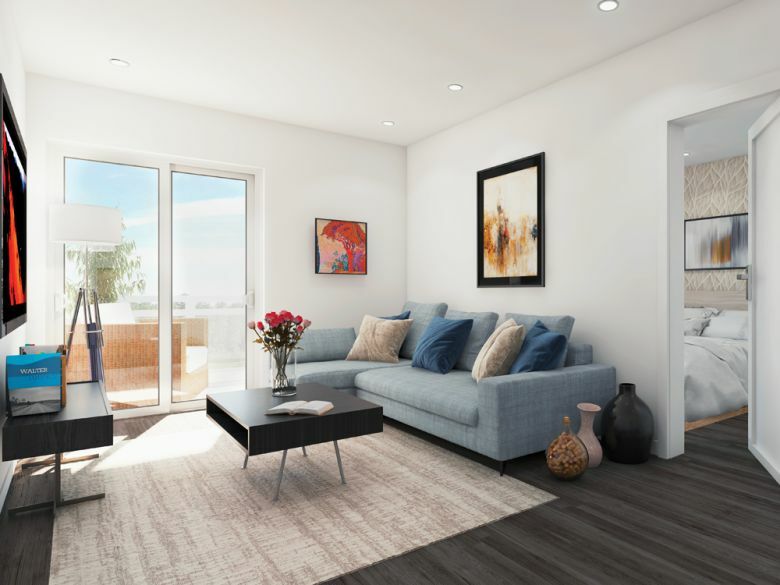 Adding to the townhouse offerings at the developer’s ongoing Blue Fairway community, The View will feature two mid-rise buildings of four storeys each when completed, with 72 units in total. Buyers will also be able to enjoy onsite amenities like an outdoor saltwater pool and fitness facilities, while most units come with underground parking. Two-bedroom and two-bedroom-plus-den units are available, ranging from 846 to 1,015 square feet. Prices start at $329,990. But while the water sports of Georgian Bay and skiing of Blue Mountain Resort are both nearby, the views on offer here are of something else completely: the 18-hole Cranberry Golf Course, with 6,750 yards of fairways and beautifully, manicured greens are just next door. The course is just one of several golfing options in the area. For hikers, cyclists or cross-country skiers, the 34-kilometre Georgian Trail also passes right by the development. And that’s just the start. Blue Mountain Village offers more than just the downhill skiing the area is known for, there are shops, activities and local events hosted here. The Scandinave Spa, with its Scandinavian-style hot and cold pools, is another local hotspot, while Collingwood itself has attracted a range of shops and amenities. As it’s grown into a four-seasons destination, restaurants and nightspots like Gibson and Company, Sol Kitchen, Sushi Hon and Crow Bar & Variety have emerged, appealing to locals and tourists alike. The View was designed to build on the resort-style lifestyle on offer in Collingwood and its surrounds. With glass railings and sightlines overlooking the golf course, it will feature exterior corridors leading to the units, which each run from back to front — different from traditional condos, which have an interior hallway in between. “You have people underneath you and beside you, you don’t have somebody in front or behind,” Pasquale explains. In some cases, the developer adds, The View and Blue Fairway’s previous phases of townhouse units have even become a multi-generational affair. “We have some retirees where the parents have chosen to retire in one of our bungalow townhomes in Blue Fairway, and their kids as investments and weekend properties have bought in one of the mid-rise buildings at The View,” she says. It’s that mix of buyers that helps make Collingwood one of MacPherson’s go-to spots to develop. The developer, based in Richmond Hill, has been building in Collingwood for about 20 years, and in that time has seen the community evolve into what it is today. Occupancy at The View is slated for Fall 2020. The sales office is located at 5 Cranberry Trail E., Collingwood, and open Wednesday to Sunday from noon to 5 p.m. For information, call 705-293-2201 or visit theviewcondos.ca.